Pressure Garments: A Manual on their Design & Fabrication presents the development and principles of pressure therapy. It discusses the physical description and treatment of burns. It addresses the emotional and physical effect of scars caused by burn injury. 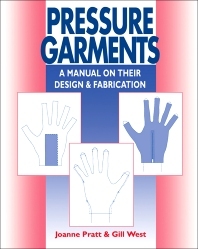 Some of the topics covered in the book are the comparison of keloid and hypertrophic scars; management of hypertrophic scarring; methods of pressure application; complications of pressure therapy; pressure therapy treatment regimen; stages in garment design and production; glove measurements; and design considerations. The description of upper limb garments is fully covered. An in-depth account of the measurements, pattern drafting, fabric cutting, and sewing of the garment is provided. The book can provide useful information to therapists, students, and researchers.